Another old Detroit plant falls to the wrecking ball. 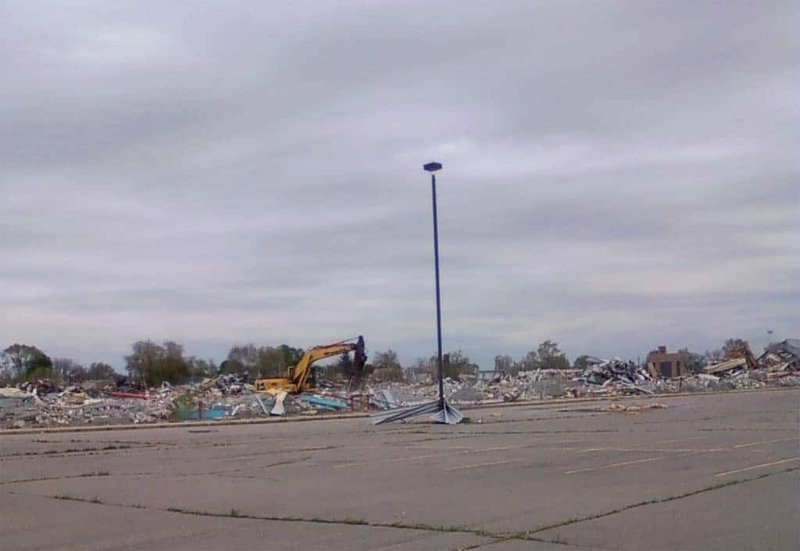 The last tangible evidence of one of Detroit’s iconic brands was rapidly disappearing this week as demolition contractors tore down the last of the DeSoto plant, 50 years after Chrysler Corporation discontinued the car line. 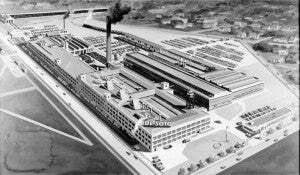 Moreover, the Albert-Kahn-designed DeSoto plant on Wyoming Avenue between McGraw Avenue and Ford Road at the western border of Detroit, was the only automobile assembly plant erected in America during the Great Depression. Chrysler also built a truck plant in the period—but that was it for new auto assembly plants during those tough years. Until its demise, the DeSoto plant’s huge billboard stood as a nagging competitive symbol above the Ford Freeway (later I-94) that Ford and especially Mercury executives could not help seeing as they headed back and forth from their nearby Dearborn offices to downtown Detroit or their eastside homes. DeSoto was conceived by Walter P. Chrysler a couple of years after the 1924 introduction of the Chrysler brand, a modernized Maxwell. Walter P, a former Buick executive, had observed the success of Alfred P. Sloan’s reborn General Motors with its array of medium-priced cars based on “step-up” features. So he set out to add to the new Chrysler Corporation a low-priced Plymouth to compete with Ford and Chevrolet and a medium-priced DeSoto, matched against Oldsmobile, Buick and the host of successful independents headed by Hudson, Nash, Studebaker and, well, Dodge. An early rendering of the sprawling DeSoto plant. DeSoto would be just a cut below the Chrysler, which already was adding larger engines and other features. In the meantime, New York and Boston bankers were trying to find a buyer for the Dodge Brothers company–acquired from the estate after death of the brothers in 1920–which had a line of cars and light trucks. Some historians have argued that Chrysler announced the DeSoto to drive down the bankers’ price and willingness to deal for Dodge Brothers. But eminent academic historian Dr. Charles K. Hyde points out in his 2003 “Riding the Roller Coaster” that DeSoto was already in the works before the bankers appeared in Walter P’s crystal ball. In any event, in the 12 months after the 1929 DeSoto was put on sale in early August 1928, its sales of 81,065 were the greatest for any new model until the 1960 Ford Falcon came along, even better than the 1938-39 first year of Mercury. DeSoto almost bit the dust in 1934 when it was saddled with Chrysler’s advanced but unpopular Airflow design. Conventional Airstream models, rushed into production, saved both brands. 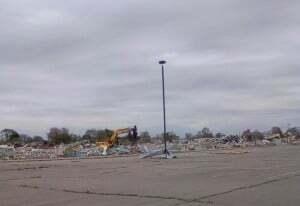 All that remains of the DeSoto plant, which was designed by Albert Kahn, who also designed the vast Ford Rouge assembly complex. After negotiating acquisition of Dodge in the summer of 1928, Walter P found himself with one too many medium-priced brands. His main objectives in Dodge were its truck line and manufacturing facilities at Dodge Main in Hamtramck, so the corporate line-up had to be rationalized. What resulted was three dealer networks: Chrysler-Plymouth, DeSoto-Plymouth and Dodge-Plymouth. This helped Plymouth compete handily with Ford and Chevy, and slotted DeSoto as a step-up from Dodge in the medium price field. This stood Chrysler Corporation in good stead in the rush to supply pent-up demand for new cars after World War II. 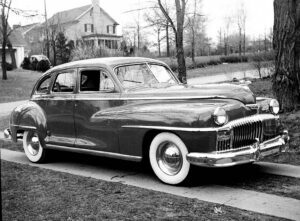 I fondly remember my father’s shiny new 1948 gunmetal-grey DeSoto Custom four-door sedan with soft green interior trim. The listed price, not including such options as radio, heater, shiny wheel covers and white-sidewall tires, was $1,892. Also optional at $121 was the two-pedal “Fluid Drive with Tip Toe shift,” and it became the first automatic (well, really, semi-automatic) transmission car I drove. You pushed the clutch pedal down to engage the transmission and after that, needed the clutch only to, say, go from reverse to forward or vice versa. Upshifting from “low” to “high” was accomplished by lifting your foot off the accelerator pedal briefly. There was a push button starter button in the lower center of the instrument panel, next to the key slot for the ignition lock. Unlike manual transmission cars, this DeSoto (and Chryslers) had no “first” position; the “H” pattern instead was like an upside down lower-case “h.” In those days, all American passenger cars had column-mounted shifters. However, as a high schooler, I soon discovered—or learned from my peers—that the DeSoto could be started in gear without pushing in the clutch, and that if you put the transmission lever in the bottom upper, or “second” position, it engaged a sort of extra low gear which provided startling (for the time) acceleration from a dead stop. Then you could upshift by lifting your foot briefly off the accelerator. Despite a modest 236.6-cid, 109-hp flathead Six, it flew, surprising many an ambitious amateur street drag-racer thinking he was facing off against a slush-o-matic Fluid Drive. This was all well and good for my reputation until the family doctor spotted me challenging a Terraplane and ratted me out to my father, ending in my clipped wings. 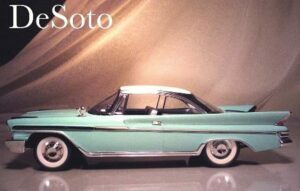 So I have a soft spot in my heart for DeSoto, though I never owned one. The 1948 DeSoto owned by author Mike Davis' father. DeSoto’s best sales year was 1953, when new registrations totaled 122,342, or 2.13% of the US market. Ultimately it became another victim of the intense sales battle between Ford and General Motors in the mid 1950s. Buick 1955 sales actually edged out Plymouth for Number Three position. 1952’s DeSoto Firedome hemi V-8 and 1957’s Forward Look briefly boosted DeSoto fortunes but sales declined rapidly through 1958 (a slump year for the industry) and 1959 until DeSoto’s final 1960 tally of a mere 23,063 cars. Edsel had folded its short life in November 1959 right after its 1960 models went on sale. Chrysler management had read the smoke signals and decided to pull the plug on DeSoto. This involved ending both the DeSoto-Plymouth and Dodge-Plymouth franchises, dualing Plymouth only with Chrysler, and reconstituting bottom series Dodges as low-priced competitors to Ford, Chevy and — Plymouth. Over its 32 years in the marketplace, more than 2,000,000 DeSotos had been produced, a big number considering the modest size of the American auto market of the time. The last DeSoto built, on December 30, 1960, was a $3,100 1961 Adventurer two-door hardtop with 361-cid, 265-hp V8 and a 122-inch wheelbase. But that was also the year the Big Three introduced their new compacts—Falcon, Corvair and Valiant, and the previously well-ordered domestic auto market was never the same again. And now the newly cleared 29-acre one-time DeSoto plant site is on sale for a measly $2,150,000. Complete with rail siding and a view of I-94, once known as the Detroit Industrial Highway. Such a deal. This entry was posted on Thursday, May 26th, 2011 at and is filed under Automobiles. You can follow any responses to this entry through the RSS 2.0 feed. Both comments and pings are currently closed.